Members of all listed colleges and communities are welcome to apply for trans-inclusive housing, however this room option is located only in the Merrill Residence Halls (for first-year students) and the Redwood Grove Apartments (for continuing students). Trans-inclusive Housing areas are intended to create safer and supportive spaces to live for transgender and gender-nonconforming students, and their allies. Students may room together regardless of gender or legal gender. Please note that this room assignment is likely to be on a mixed-gender floor/apartment and all students share common areas (e.g. bathrooms). Students who do not request a roommate(s) on their housing application will be assigned a roommate(s) based on preferences expressed in the housing application and a follow-up conversation with a housing staff member, if necessary. Only students who indicate an interest will be assigned to Trans-inclusive Housing (supplemental application required). Kathy Cooney, Associate Director College Student Life, serves as the housing liaison for trans-identified students and can assist you with any questions or concerns you may have about which on-campus housing option (including but not limited to trans-inclusive housing) may best align with your needs. Kathy can be reached at (831) 459-3642 or kmcooney@ucsc.edu. LGBTQIA+ Residence Hall: Safe and open living environment for students who identify as gay, lesbian, bisexual, transgender, queer, questioning, or allies. This community is located within the Diversity Awareness House. LGBTQIA+ Residence Hall: Safe and open living environment for students who identify as gay, lesbian, bisexual, transgender, queer, questioning, or allies. This community is located within the Diversity and Social Justice House. LGBTQIA+ Supportive (ResHall): Safe and open living environment for students who identify as lesbian, gay, bisexual, transgender, intersex, queer, or questioning. 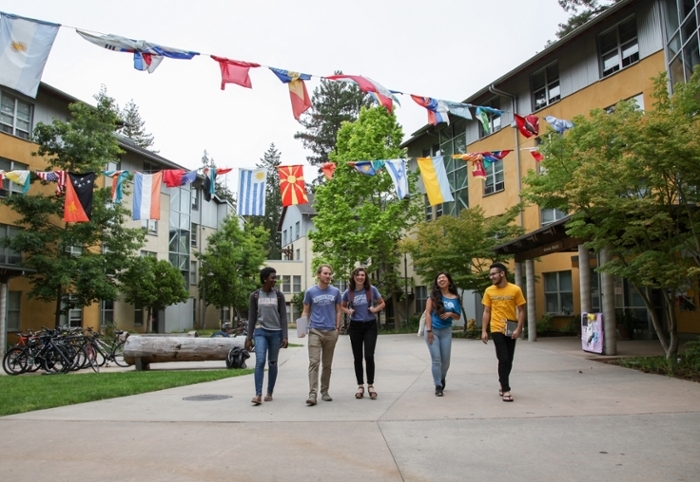 Merrill College is nestled in the beautiful redwoods at the top of campus and is home to the Cantú Queer Center. Merrill has the longest running LGBTQIA+/trans-inclusive theme community on campus where students who are queer identified or supportive live together. Merrill hosts a number of annual LGBTQIA+ themed events including Glitterball, Coming Out Day Cafe, the Faux Shaux and others that change each year. Needless to say, Merrill prides itself on being a welcoming and inclusive community with a large and active LGBTQ+ population. LGBTQIA+ and Allies (ResHall): Residents who identify as Lesbian, Gay, Bisexual, Transgender, Intersex, Queer, Questioning or an Ally may chose to live on this hall. Porter College is one of the largest colleges on campus, well known for its exciting and quirky student body. The recently rebuild residence halls hosts a LGBTQIA+ and Allies floor, with specific queer themed programs. It is also the host of the annual Queer Fashion Show which occurs every spring. Other examples of past programs include: "Transgeneration" - a documentary series that followed the lives of trandered college stduents and "Growing Up Male and Female" - a workshop facilitiated by peer educations. It is a great opportunity for students to get involved in the expression of their queer identity, whether through dance, song, poetry, fashion or even event organizing. Depending on student interest, Prism, a LGBTQIA+ and Ally student organization also creates queer events for the Porter community. Oakes College is the college the furthest down the university hill, giving it a beautiful view of the bay. Its two LGBTQIA+ and Jewish-themed housing blocks, Milk Block apartments (for continuing students only) and the Bayit Wiesel residence hall, are named after prominent LGBTQ+ and Jewish activists, tying into the college's theme of Communicating Diversity for a Just Society. Milk Block, Oakes' Lesbian, Gay, Bisexual, Transgender & Jewish Theme Apartment Block, is named after Harvey Milk, the first openly gay person elected to the San Francisco Board of Supervisors. Milk began organizing politically after moving to San Francisco. Dubbed the “Mayor of Castro Street,” he owned a camera shop and helped create a safe community for gay and lesbian people. The Castro remains one of the most dynamic cultural and political centers of queer life in the U.S. Milk’s activism brought new energy and urgency to the LGBTQIA+ rights movement. Milk was also Jewish and it’s been noted that he enjoyed speaking Yiddish with fellow San Francisco Jews. He was very proud of his heritage, and his life certainly embodied the Jewish tradition of tikkun olam, or “healing the world.” In November 1978, Milk was shot and killed by a fellow San Francisco Supervisor who opposed his political and humanistic ideals. Milk remains a symbol of hope in the struggle for equal rights. Students who choose to live in Milk Block are invited to participate in positive social change as a way to honor Harvey Milk’s legacy. Bayit Wiesel, Oakes' Lesbian, Gay, Bisexual, Transgender & Jewish Theme Residence Hall, is named after Nobel Peace Prize winner Elie Wiesel. Wiesel was 15 when he and his family were sent to the Nazi concentration camps. Prisoners were given a badge to designate their “type.” Jews wore two yellow triangles in the form of a star, while gays and lesbians wore inverted pink triangles, and were often singled out for especially harsh treatment by guards. Bayit Wiesel’s inclusive theme recognizes the shared history of persecution and survival amidst horrific violence that Jews and gay people experienced. Wiesel’s parents and one sister were killed in concentration camps, and he was reunited with his two remaining sisters after the war. Wiesel’s experience compelled him to write more than thirty works regarding the Holocaust, of which, Night, is the most popular and widely read. As a survivor and witness of the Holocaust, he has dedicated his life to seeking justice for oppressed people. His core humanistic and egalitarian principles serve to guide us all, and especially residents of Bayit Wiesel, to contribute to movements for social justice and equality. LGBTQIA+ Residence Hall: This housing option allows those who identify as lesbian, gay, bisexual, transgender, queer, questioning, intersex and other identities within the LGBTQIA+ community as well as allies to live together in an open and supportive environment. LGBTQIA+ and Allies Residence Hall: Students who identify as lesbian, gay, bisexual, transgendered, intersexed, queer, questioning and/or allies. Only available in mixed-gender areas. Though they do not provide housing specifically themed for the LGBTQIA+ community, other colleges also incorporate themes of LGBTQIA+ diversity in their housing offerings and themes. Crown College, for example. houses a Social Justice and Diversity themed floor, and hosts the annual Social Fiction Conference, both of which provide a place for LGBTQIA+ activism to foster. Every year, Kresge College hosts the Kresge Pride Festival, an LGBTQIA+ celebration that pulls in the whole university population. With booths, performances and free food, it is one of the largest queer events of the year. In addition, there are many LGBTQIA+ sponsored programs put together by the Kresge Multicultural Education Committee (KMEC).